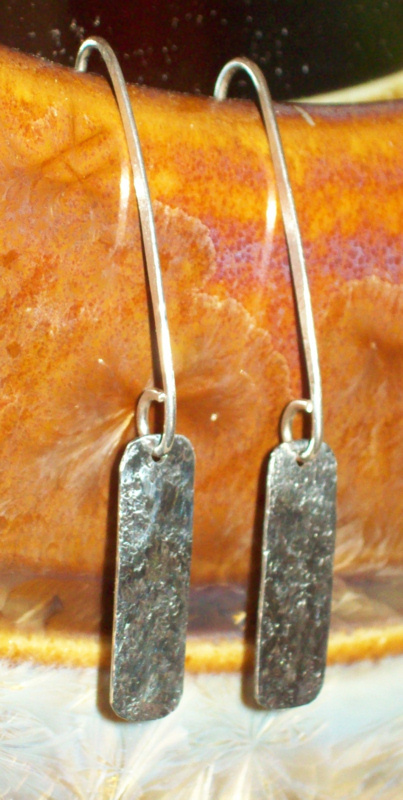 Sterling silver drops of hammered silver. Although copying our clothing designs is considered a form of flattery, we take this act as a theft of our intellectual property. None of the pictures may be copied, reproduced, republished, uploaded, posted, transmitted or distributed in any manner whatsoever, except for viewing purposes, without the prior written consent of Keri DeWitt. Keri DeWitt owns all copyrights for all images of her work. Keri DeWitt also owns all trademarks, service marks, trade names, logos and domain name used on or in connection with this Site. Any modification or use of the materials from this Site for any purpose not explicitly permitted is a violation of Keri DeWitt and it's copyright and other proprietary rights. Legal consequences will be taken to insure our intellectual property is protected.